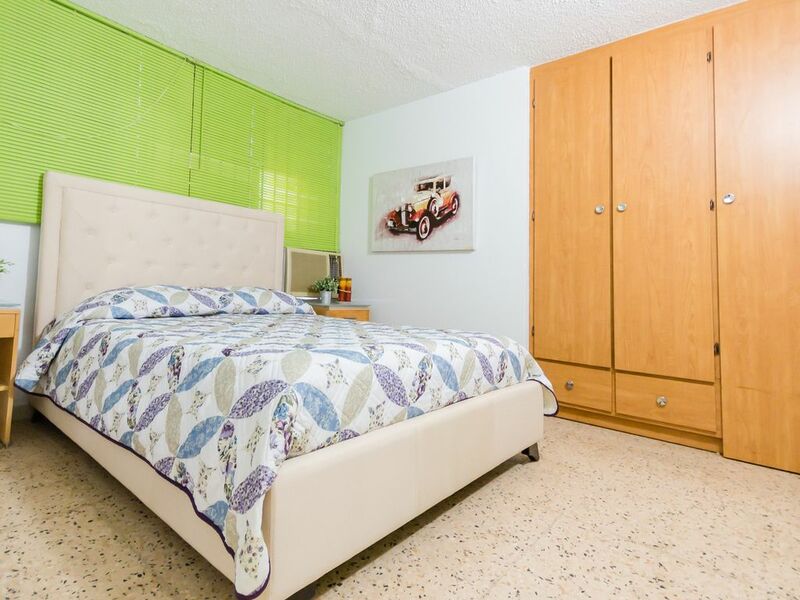 Enjoy the fabulous neighborhood of Manati when staying in this Caribbean inspired unit. This tastefully furnished Family Two Rooms Villa, Queen Bed &amp; Two Full Size Beds, 1st Floor is both modern and comfortable. It features a fully stocked kitchen with every necessary tool and appliance, a squeaky clean bathroom with toiletries and water heater, and a cozy separate living and dining area. Each of the two bedrooms is appointed with 42" flat screen cable Tv's featuring over 200 channels, air conditioning, and includes plenty of closet space for longer stays. Conveniently located in a complex of private residences the one story multi-unit building features a spacious open-terrace perfect for taking your morning coffee or simply sitting in enjoyment of the nice climate. Wifi, of course, is included. There are many close by establishments for guests to stock the fridge, do some shopping, and buy souvenirs. However, if your intention is to visit all the historic sites or the beaches, although close, some means of transportation is needed. If you are up for an adventure our public transportation system is very informal but can get you almost anywhere if you have time and patience. But if I were you, I would rent a car or rent a tour guide. Manati is known as the Athenas of Puerto Rico, hometown to many of the islands great poets, visit the municipal library to explore the history of this quaint town. Make sure to also visit the "Teatro Taboa" where many a nights local theater groups graze the stage of this century old theater. Downtown Manati - walk the streets and take in century old buildings as you get a taste for local daily life. Barceloneta Premium Outlets, said to be the best shopping of the island. Also find here a movie theater, many restaurants, an arcade and much more. Hacienda La Esperanza, a restored 17th century sugar mill. Explore the inner workings of the mill, the estate where the original owners lived, and slave quarters.